Mustard and Cheese has come a long way since it was first organized as an outgrowth of meetings held by a small group during 1884 in the back room of Renning’s bar. The leading spirits were brothers Richard Harding Davis and Charles Belmont Davis. R.H. Davis was a Lehigh University campus leader, whose influence was felt in other activities as his enthusiasms turned every enterprise he undertook into an adventure. At the Saturday night neetings the menu consisted of talk, sweitzed cheese and mustard, washed down by beer. When a name for the “club” was sought, it was unanimously agreed upon that “The Mustard and Cheese Club” would be most appropriate. The first performance was Mary, The Child of Misfortune, written by R.H. Davis, and presented early in 1885. The first public performances were “‘Love and Money’ A Melo-Drama in One Act” and “‘Sir Dagobert and the Dragon’ A Romantic Extravaganza in Three Acts.” These were held at the Sun Hotel in Bethlehem on April 10, 1885 and the proceeds were devoted to repairing the athletic grounds. Women were an exciting addition to M&C in the late 1800s even though women would not come to Lehigh until 1971. The first plays were given in the auditorium of Drown Hall, then after World War II, the productions were staged at Broughal Junior High School. In 1958 the Division of Speech was created within the English Department and in 1959 M&C was given a home in the Lamberton basement. 1972 saw the expansion of the Division of Speech to become the Division of Speech and Theatre. In 1975 Lehigh awarded its first Bachelor’s Degree in Theatre and began to convert an old power plant into the Wilbur Drama Building. 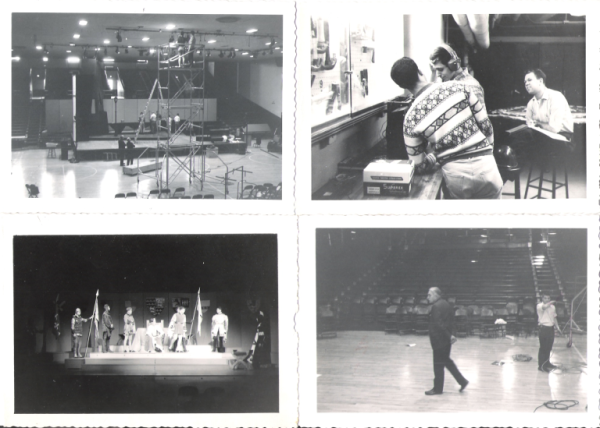 Finally after much work by the professors, July 1st, 1988 Lehigh opened the Department of Theatre. Ten years later Lehigh and the surrounding community gathered to celebrate the opening of the Zoellner Arts Center, which is currently our home. Our mission is to not only uphold the traditions and principles on which the society was founded [to serve, support, and promote theatrical activity at Lehigh University], but also to create, support, and encourage projects in the theatre arts. Our goals include reaching out to the student body as well as members of the surrounding community, bringing theatre into their lives and sparking their interest and participation in theatre at Lehigh University. Membership grants you access to the early M&C information and allows you to attend exclusive events including the M&C Spring Semiformal.